Gilad Erdan participates in Temple Mount lobby meeting, expresses support for goals, but notes status quo on Mount lies with Prime Minister. 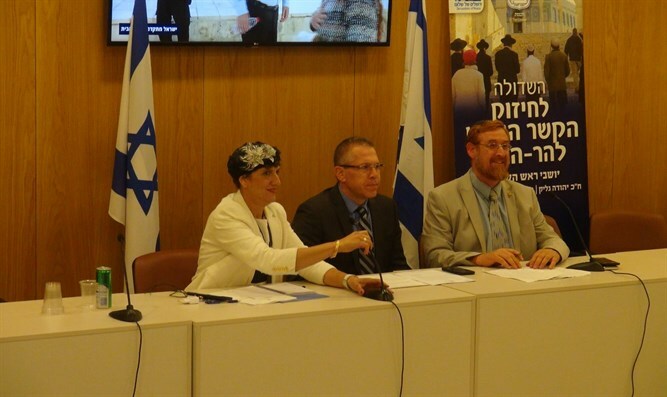 Internal Security Minister Gilad Erdan took part in a meeting of the Lobby to Strengthen Jewish Connection to the Temple Mount headed by MK Yehuda Glick (Likud). Erdan thanked the Lobby for the invitation and congratulated Lobby heads. "Most of all, I thank you all for your activities all year round, because in the end the State of Israel almost gave up sovereignty in the holiest place for the Jewish People. "Thanks to your activity and the organizations and your perseverance and not giving up we can truly point with pride and satisfaction, and with more aspirations, to the development and progress in freedom of access and visits of Jews to the Temple Mount," Erdan added. Erdan mentioned the fact that the Temple Mount is the holiest place only to the Jews, "I don't really understand the public discourse about the Temple Mount. Are we really the same Jewish and democratic state that we're always proud of? After all, the Temple Mount is the holiest place only for Judaism - to Islam it's the third most important place. It's the place from which everything began, and where the Holy One tested Abraham. "Our enemies understand what sometimes is unclear in political discourse. The debate between us and our enemies has never been a territorial dispute, but between the Jewish People and radical Islam that doesn't accept our existence here. Therefore, because we're a Jewish state, this means that first of all Jews should have access to the holiest place for the Jewish People," Erdan added. "Since 1967, fifty years after liberating Jerusalem and the Temple Mount, the Muslims are the only religion who can pray on the Temple Mount," Erdan said. "It's important for us that Muslims be able to pray on the Temple Mount, but the unbearable situation that a Jew visiting the Temple Mount is attacked and threatened cannot exist, and this was the basis for changing my policy." 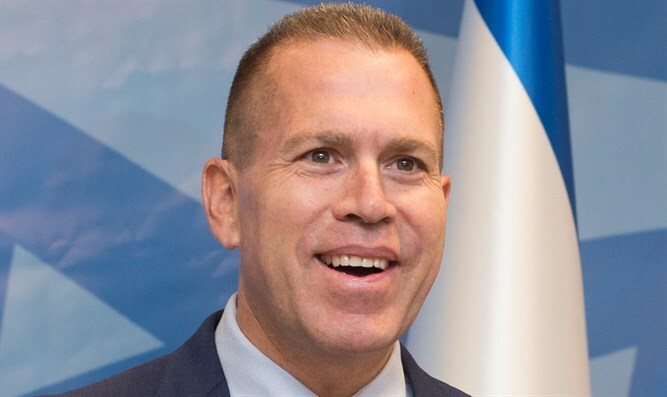 Erdan stressed that he supports allowing Jewish prayer on the Mount, but emphasized that the issue is the Prime Minister's responsibility. "Whoever believes that we're in a Jewish and democratic state must support the right of Jews to ascend the Temple Mount and pray on the Temple Mount. I'm Internal Security Minister and not Prime Minister. There's a status quo that exists vis-à-vis the Jordanian government, and any change that alters the status quo must be taken into account by those responsible for national security of the State of Israel." However, Erdan noted, "It's possible that salvation will come from another, unexpected place, from the Supreme Court, which ruled it impossible to rely on past regulations if they don't have a basis in updated primary legislation. The same thing seems to be valid on the Temple Mount. I understand there's such a petition that says rights cannot be restricted even for security reasons, unless there's authorization in primary legislation. At the moment the police are acting according to past decisions, and I certainly think there must be a lively public debate on the issue. It's good that you're doing it." "I think it's good that the Prime Minister has reinstated visits by ministers and Knesset Members, and in my view it's insane that precisely they, who should have right of access, are the ones denied access," Erdan said. "Thank you for the daily effort; it's very exhausting and frustrating, but I want to send on your behalf very many thanks to District Commander Yoram Halevy and to former district commander who laid the infrastructure, Chico Edri, to the Commissioner and to all the policemen and policewomen."